Adjacent to Merge Architects’ 282 Marginal Street Lofts, is a newly constructed six-unit multi-family residential building. 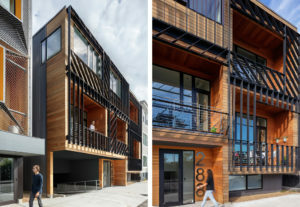 Located between the residential neighborhood of Jeffries Point and an active shipyard containing the Institute of Contemporary Art’s (ICA) Watershed public art gallery and cafe, the design utilizes industrial materials to craft a contemporary interpretation of context while negotiating the boundary between building and city. 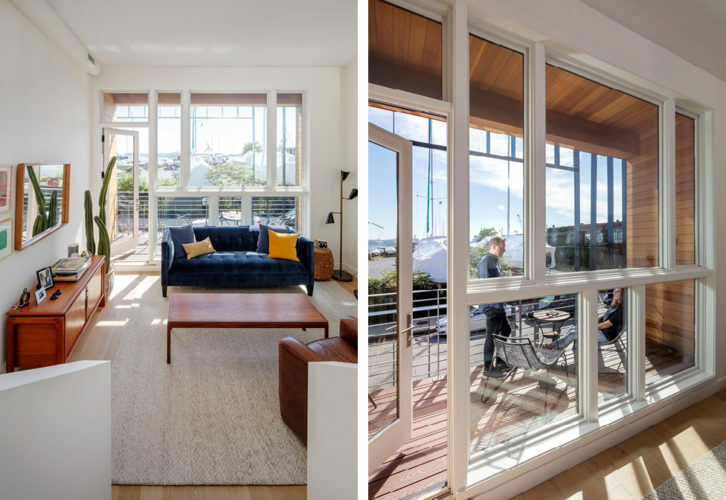 Planning limitations, including height restrictions imposed by neighbors, parking requirements from the city, and the developer’s desire to provide water views for every unit, presented an opportunity to strategically rework standard residential typologies. 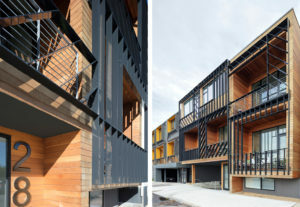 The result is a series of tube-like, stacked units interlocked to create sectional and proportional shifts within the space of the unit and site. Living, dining, and cooking areas on the front of the building are compressed and often terraced in section, leading the eye through a series of layered space toward framed views of the water and Boston skyline beyond. 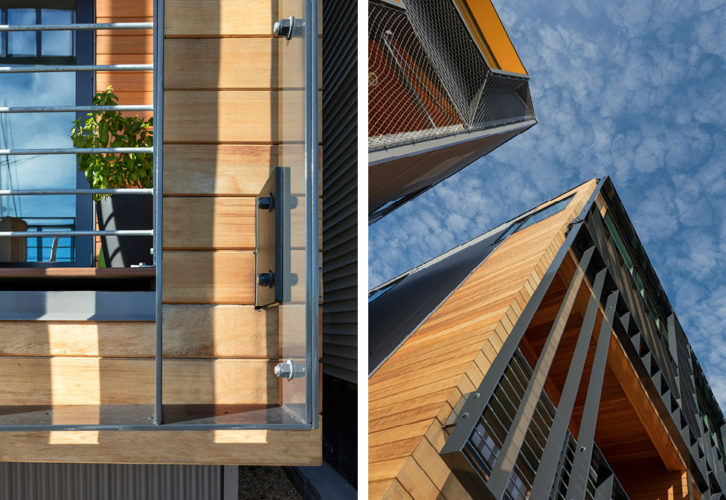 Sleeping spaces in the rear of the building are compact in plan and tall in section, providing a unique spatial release at the back of the site. 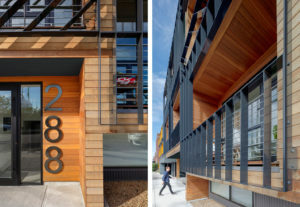 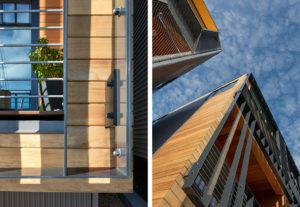 The envelope of the building is wrapped in an industrial mix of materials that includes corrugated metal siding on back and side facades, and a custom steel fin brise soleil, which floats off a series of balconies and red cedar shiplap on the front facade. The warmth of the red cedar relates well with the adjacent triple-decker clapboard homes along the street, and the massing alignment with the adjacent stoops and entries embraces the transition from the industrial to the residential context of the neighborhood. 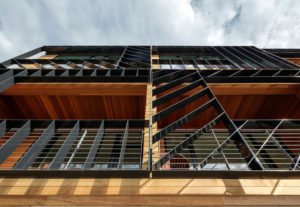 Merge Architects worked closely with a highly skilled team of metal workers to develop a holistic design/fabrication approach: We utilized readily available stock steel, conceived of the brise soleil fins in panel sections that easily fit onto a freight bed, and mapped the location of the bracket connection back to the building that would allow for movement and tolerance. 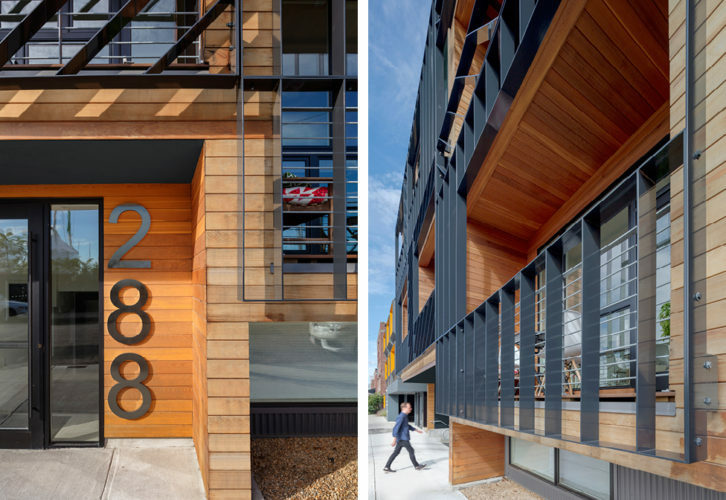 The fabricated panel sections were arranged on site and composed to allow for large openings that frame water views while continuing the elevational pattern set by the original adjacent 282 Marginal Street Lofts. The porous boundary of the steel brise soleil allows for a filtered transition from the private space of the unit onto the public streetscape, while the parking carve out/open space below and lobby at ground level become an extension of the sidewalk.